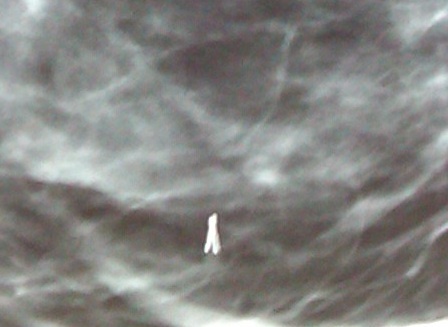 Back in 2002 when I got my first mammogram, blogging was new. Google had not yet acquired Blogger. Blogs were usually like diaries — more personal, like logs that you keep for yourself — just that you keep them on the web — in a word: weblogs. In fact I blogged — but I blogged privately, using blogging just like an online diary. It was that process — my first mammogram and my subsequent surgical biopsy — that opened me up to public blogging. I blogged the whole experience, sharing pictures and anxieties — and relieving results — in a trail across the Internet that lives on today as scars live on my body. It’s been a profound experience, both to share something so scary and personal, and to tie together stories, search terms, and information with actual humans searching for information; perchance for solace. What an evolution in the last decade or two. When I approached the date of my second biopsy, an ultrasound-guided core breast biopsy on a palpable lump in my left breast, I of course went to the Internet. (The biopsy was last Friday. I just got the results. My lump is benign tissue with stromal fibrosis. My breasts seem to always be doing something interesting, so we keep very alert about them, but I am of course awash in relief). One big difference in the Internet is that nowadays it’s harder than ever to find personal stories — at least using conventional search engines. If you search for typical breast diagnostic terminology, you have to wade through pages of marketing materials and corporate communications before finding people’s blogs. It’s harder and harder to find a personal story from an actual person who has gone through any procedure, even while supposedly searching “blogs only.” I had to resort to the WordPress-specific blog search, and even then wade through results to find personal stories. It’s good news that more and more institutions themselves blog, but what a change from the days when “blog” meant a personal diary to being an official organ. It’s true I found lots to fear on the Internet. But it’s also true that these things happen. When you’re told you need to get a biopsy, you can’t help but imagine you are already a person living with cancer — with or without the Internet. There are studies (of course, official studies — I found them on the Internet!) on levels of cortisol that back this up. The days stretch eternally till the procedure, then until the results (no matter how fast or efficient – for which I am incredibly grateful). In the end, the sharing of these stories is personal, political, and highly necessary. Not only have women come to me thanking me for sharing via blogging, but I’ve found solace in reading the experiences that others go through — usually so common even in differences. This is not even to mention the variety of edge cases — for example, the men who get breast cancer and must feel desperate in the search through the long tail. Thank goodness for the tail. This is so valuable. May the Internet never cease to be a place of real personal sharing. Of my core breast biopsy procedure I can share that it was painless if a bit strange to be “shot” four times in the breast with a little compact needle-gun, and three days later I have a colorful rainbow of bruising but probably no scarring this time — and of course I am incredibly fortunate in the results. And finally, there is a little something the procedure left behind, to mark the spot in future mammograms: a tiny titanium chip. I’m fascinated by my new bodily resident and find it looks a lot like a ribbon – which apparently it does. I took a picture of it since I can’t see it and can’t feel it otherwise, and find it looks a bit like a tiny comet-like object suspended just there in my fibroid tissue, hard to focus just like a celestial mark in the sky. I can’t help but muse over what will last longer — the marks on my body, the marks across the Internet, or my titanium chip. it’s been a long time since i revisited my breasts, but they and i went to go see dr grissom today for another checkup. it’s been nearly a year now since my biopsy, and dr grissom gave me a breast exam and gave my scars another once-over. the lateral scar has been fading – it’s healed pretty nicely and i imagine more so within the last couple of months. the medial scar is simply a keloid. i’d been using this ‘scar away’ or ‘scar be gone’ or whatever stuff on it since my last visit with dr grissom on her advice, and actually, now it’s sort of two clear keloids or bumps, surrounded by red tissue. she said she could send me off to plastic surgery and they could pop the keloids out and sew it back up again, but on the other hand, i might just have a tendency to keloid and in that case would just keloid right up again after said surgery. so we are waiting a little longer to see. i have a follow-up visit— in awhile. dr grissom gave my keloids a onceover today, and gave me some stuff to use called “scarless”. i’m going to try this stuff for six months, then i go back to see her. if there are still red lumps, she said she’d just excise them right in the office. i asked her if these caused any other problems – like problems with mammograms – and she said no. she said the scar probably iches, which i confirmed! at any rate, the lateral incision is healing nicely, and this medial one won’t look like this forever, it seems. judging by the deep grey color and smooth texture of the fog cover outside my window, and by the fact that it was at least twenty degrees warmer before i started home tonight, i’d say it’s the peak of summer. the perseids are on their way back, and apparently mars is approaching as close to the earth as it ever has been in recorded history! all of this rivals the excitement of getting to see dr grissom again tomorrow morning. i was due there last week, but her office called to reschedule, and did not confirm today, so it’s possible i will have slipped through the cracks. if not, i should get a better read on what’s to do with my medial scar. i took some new pictures of it yesterday, and perhaps i will be in the mood to post them and compare with those i stopped posting – oh – may or so? it looks like two hard red knots on either side of the incision – basically, where the knots of the sutures themselves were. it’s really quite odd — because before i started all this breast mammography and biopsy business, i never had lumps like this. and now i have definite lumps – something that should strike fear in any woman, even if just from a scar. best wishes go out to elaine, blake’s mom, who began aggressive chemotherapy today in albuquerque. she visited san francisco last week, giving us the opportunity also to see the lovely whirlwind that is blake, to get a second opinion from the folks at california pacific medical center. she’s apparently got a really very serious, nasty inflammatory cancer. blake has gone out to join her (having successfully procured new car keys after slipping her old ones down the elevator shaft). we are thinking of them both and hoping for the best things… the best in western and holistic medical attention, the best friends and support systems, a little oasis here and there, the assistance of a bright visiting planet, a little magic, some refreshing coolness now and then, like yesterday’s creamy coconut sorbet from mitchell’s, a blanket of fog under the summer heat. it’s time to bring some female reproductive parts back into this weblog, since that’s what’s advertised. i hope searchers don’t arrive disappointed and mumbling about ‘truth in advertising’, and that the links on the right do prove useful to people searching for info about calcifications, mammograms, and breast surgery (which site stats show people arrive so doing). hopefully, the search engine helps a bit too. currently, i’m beaming about my pelvis. my pelvis feels strong and complimented. i got to see the lovely dr madelyn kahn for my annual scrape today, and though my breast may not be healing as nicely as hoped, my pelvis, said she while palpitating, is in fine shape! she told me i should pass it down. on the other hand, she was able to verify that my medial breast incision had, in fact, keloided — hmm, is that the proper tense? i suppose there is no verb form, but the idea should come across. to those regular visitors who search for weekly breast updates who have been disappointed since the promising start: that’s pretty much why. it doesn’t really look any different from the last picture i posted months ago. i gather that is because it is ‘a keloid’, and that i now know that i have ‘a tendency to keloid’. i’m not sure what, if anything, it has to do with the irritation caused by my internal sutures, but she said dr grissom would be able to fix it. that’s the next in my spate of maintenance visits: dr grissom, july 15. summer of doctorly-love. i went to see nima grissom about my little knot today; “you couldn’t stay away, could you?” she taunted me as she walked into the office. my secret’s out — it’s true. i feel like a bit of a rock star when i get to see dr grissom. or i feel like she’s a bit of a rock star. perhaps it’s all those breasts she handles. or her skillful hands. or because she’s the one holding the knife… or something. sure enough, just as she had advised in her postoperative instructions, it only took a couple of minutes to deal with the incision. she got out some kind of tweezers and fished out what looked like the knotted end of a fishing wire, the kind my brother used to tie flies with. she said it seems like i’m the type that just gets irritated by and tends to reject internal suturing, and that for future operations, i should probably get a different kind of suture. funny that it was just one side of one of the incisions that kicked up such a fuss. i asked her if this meant it wouldn’t heal properly and she said it should be no problem healing, and even if it was, she could re-suture it if necessary. she asked me to come back and see her in three months, so i have an appointment on july 15. midsummer. my goodness. midsummer. i did ask about two additional things that had been whittling at me – about how much tissue was taken out, and about what happens to it afterwards. now, it occurs to me that doctors probably aren’t excited about the prospect of someone writing about them on the internet, probably in case some sort of slander occurs. so now i feel an odd sense of privacy about publishing my experiences with specific doctors, even though i find this sort of thing valuable when i do my own searching online. anyway. i have no problem saying anything positive about dr grissom. about my seven centimeters, she simply said that ‘just the right amount’ was taken out. when i mentioned the marbly, hard sort of ridges around my lateral incision, and asked if the tissue would grow back around it, she said that breast tissue is indeed very forgiving (does it have to do with being female?) and that things would grow back to normal in about a year or so. now leanne, on the other hand, seems to be a bit less forgiving at present about the state of my breast. it seems it freaks her out no small bit about the hard ridges in my current left breast. i hadn’t realized that was startling to her. i suppose all things pass. the other little thing i asked about was “where does the tissue go?” they keep the tissue. they keep it, was all she said. i’m sitting up on a shelf in a jar somewhere. maybe in a cold dark room. this deepens my cloning theory. let’s see what more i can get out of her in three months. and on her way out, she asked if i wanted to take the little knot with me and we laughed. it wouldn’t make for a good picture on the internet – though i did think about it, i admit. dr grissom has a sly sense of humor and a funny sort of ducking smile. i wonder if i was awake during the surgery and could remember whether she wielded the same sense of humor with a knife. i decided everyone was covered up in masks anyway, and for all i know, i had cucumbers on my eyes and was getting a massage and facial. i know it’s perhaps a stretch, but i don’t get surgery all that often, and maybe haven’t quite gotten over that versed halo. surely to the entire viewing public’s dismay, i guess it’s best to suspend the weekly pictoral wound updates until i heal a little bit more from our latest romp. i’m supposed to apply neosporin for a few days, and should scab up all over again over the little knot. how will i wear my easter bustier? oh and for the record, since we’re talking about records, i also definitely recommend marty at hair play: http://www.sfstation.com/specialty/hairsalons/hairplay/. by the time i got home thursday night, i had a fever of 101, sore throat, body aches, chills … the whole drill. i’ve been in a hot bath or asleep since then, and leanne is once again making me nice foods. this is the longest i’ve been vertical since thursday. we didn’t get to go to vegas for nate’s birthday and i’m sad for that, but i wouldn’t have been much fun. as it is, i feel a bit on the mend, though it’s quite possible nate and a martini in his honor would have sped it along. Internal sutures are most commonly used to close the incision. They dissolve after 6 to 12 weeks. Occasionally the knot, which is tied to prevent the suture from unraveling, will come to the surface of the incision and cause drainage, redness, and irritation. This usually happens several weeks after surgery. If this occurs, please call the office and come in to have it removed. This is not painful and takes just a few seconds.